Jeff Alan West is an emerging artist creating abstract visual art in digital media, painting, and drawing. He thrives living near and surfing in the Pacific Ocean in Aptos, California, a beach community to Silicon Valley. 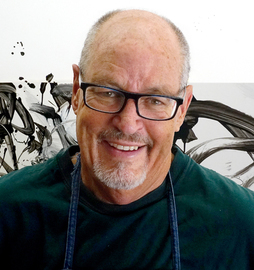 After graduating with a Masters of Art in Art - Sculpture from San Jose State University in 1979, he entered the digital age working as a production artist and graphic designer at Apple Computer Creative Services starting in 1983 just as the Mac was being introduced. Later he worked with Adobe for the premier rollout of Illustrator, becoming one of the first illustrators nationwide to adopt the software. Early group fine art exhibits include venues such as the San Jose Museum of Art, the Triton Museum of Art, and a solo exhibit at the precursor to the San Jose Institute of Contemporary Art, Artvarks. Current works have recently accepted been into the permanent collections of the Achenbach Foundation for the Graphic Arts/ deYoung and Legion of Honor Museums, San Francisco, California, the Community Hospital of Monterey Peninsula, Monterey, California, The Triton Museum of Art, Santa Clara, California, and the Crocker Art Museum of Sacramento, California. In 1987, inspired by a lecture of Richard Saul Wurman, founder of the TED conferences, he became a professional freelance illustrator and early adopter of digital imaging software, specializing in the new discipline of information illustration and design. He has enjoyed a successful 30 year career. Clients include the Fortune 500 and international companies as well as Silicon Valley start-ups. His work was included in the Digital Salon Exhibit at the Society of Illustrators in New York. He has received industry recognition for his illustrations including The Black Book AR100, Graphis Diagrams, Print Regional Design Annual, and the Society of Publication Designers. He also taught Digital Media as a full-time Professor of Art at Merced Community College of Merced, California from 2006 - 2009. Jeff Alan West has now returned his focus and energy to his fine art ideas, creating images that are abstractions rather than representational imagery. He continues to use digital painting, drawing, and imaging software as well as traditional media and techniques in his work process.